This entry was posted in Local Search, SEO and tagged directory, local seo, SEO, smb, yellow pages by Chris Silver Smith. Bookmark the permalink. You are sooo right! I’ve seen a bead store categorized under food in 20 different sources cause someone at InfoUSA mistook “bead” for “bread”! Best to check out ALL the local search engines & directories to be sure. There is a great resource for this at http://www.emarketingmatador.com/step-2-local-search-directories. Nice post — cuts right to the bone very quickly! And, thanks for the list: …”top online directory sites such as Superpages.com, Yellowpages.com, Yellowbook.com, Google Maps, Local.com, Yelp.com, DexKnows.com, Yahoo! Local.com, and any others you’d expect to find your business in, claim your listing(s), and check to see if they’re in the proper business categories! Great info Chris! I’d like to add that Google Maps will now let you create your own categories. So, if your best keyword search phrase isn’t already a category, make it one for your business. Hey, thanks Mary – that is a good tip! 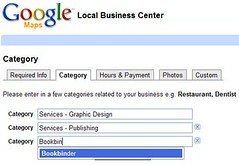 Increasingly Google is recommending that additional keywords, geographic modifiers (such as other area cities where a business provides service), and business categories be placed in these various listing parameters in the business listing (accessible via the Google Local Business Center). Nice summary. Don’t forget to use tags in the directories that allow them as well – tags often are the way that local business directories (such as ours) correlate various categories together. They can also influence site search results on those directories.